NITTE PG entrance exam - NUPGET 2014 notification - AcrossPG Exams! Nitte University will be conducting Nitte University All India Entrance Test for Post Graduate Medical and Dental Courses NUPGET-2014 on 12-01-2014 for candidates seeking admission to MD/MS and MDS in its constituent colleges, namely K.S. Hegde Medical Academy and A.B. Shetty Memorial Institute of Dental Sciences, for the academic year 2014-15. Eligible candidates desiring to appear for the Entrance Test may download the application form from our website www.nitte.edu.in. 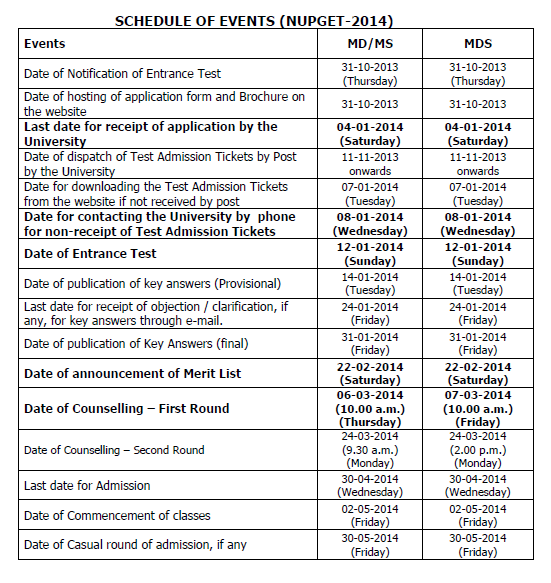 The last date of receipt of application for NUPGET – 2014 by the Registrar, Nitte University is 04-01-2014.